The Disneyworld Resort comprises four major theme parks; Magic Kingdom, Animal Kingdom, MGM Studios, and Epcot, as well as a plethora of smaller facilities. A proper visit really requires an absolute minimum of three days; Animal Kingdom and MGM Studios in one day, and a full day in each of Epcot and Magic Kingdom. However, if that length of time is not available to you, it is difficult but possible to visit the four parks in a single day using a park hopper ticket. Some of those I spoke to about this trip thought we were absolutely insane to go to Disneyworld without allowing the time to appreciate it properly. There is no doubt that this point of view has it is merits. Nevertheless, one must not forget that many of the attractions in the Florida resort are very similar to those in the other Disney parks around the world, and as such we were already familiar with them. At the other end of the scale, one of my friends pointed out that we could easily have switched into hardened coaster enthusiast mode and hit all the credits in a few hours. This idea, while possible, appealed to neither of us; Disney is about a lot more than just coasters. Before entering the resort in the morning we spent some time carefully planning out the day, both in terms of how much time we were allocating per park and which attractions therein we wished to explore. It was necessary ahead of time to be selective, with a number of lower-priority rides and shows excluded in the interests of time. Fortunately, we had a total of fifteen hours to play with, as the Magic Kingdom was open three hours later than usual for resort guests, closing at midnight. This so-called "extra magic" time was expected to be essential for us to hit everything that we wanted to. It seems only fair to document, at least in passing, the experience that is staying in the Disney resort hotels. Each of the hotels has a different theme, such as sports, music, and movies. 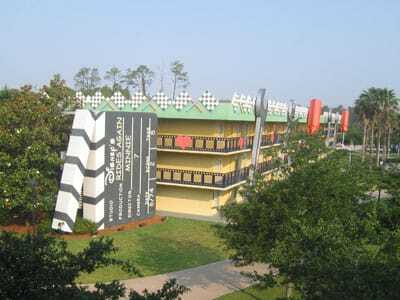 The buildings have been decorated with ten metre tall theming elements, including a large clapper board on the side of our hotel. The rooms themselves were more understated, but comfortable. The designers probably figured that guests would not be spending much time in there. I only had one criticism of the hotel as a whole; it has to be the only example of a modern resort with no internet access available. My AOL account (I know, I know...) filled in the gap after a fashion, though the connection was very unreliable for some reason. Before I get on to the day itself, I have to mention one major element of Disneyworld that I had failed to appreciate ahead of time. The resort as a whole is marginally larger than Washington DC and more than twice the size of Manhattan, running to a total of 28,000 acres. 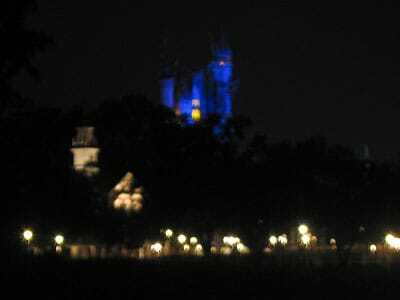 The net result is that, unlike Disneyland California and Disneyland Paris, it is not possible to walk between the parks. There are regular free coaches all around the resort, but one has to allow a significant travel time; it was a twenty minute drive between the Magic Kingdom and our hotel at the end of the night, and the driver we had might well have been a Formula 1 driver in a past life. We had decided ahead of time that we would need to get a good nights sleep before attempting an entire day in Disneyworld. The plan was to set the alarm clock for nine, and if we woke up before that point then we could head out earlier. This was precisely what happened, putting us at the Animal Kingdom gate just under thirty minutes after opening. Animal Kingdom feels like a glorified zoo. There is not a lot there that you cannot see in cities around the world, though obviously the special Disney magic will be absent; or so the marketing people would have you believe. Fortunately, those running the park have realised that they have similar competition just sixty miles away and have begun developing new attractions to keep guests returning. At the time of our visit work was well underway on a new roller coaster, Expedition Everest, and additional rides are no doubt on the drawing board too. The only coaster in the park on our visit was Primeval Whirl (#436). This attraction consists of two Reverchon-built spinning mouse coasters placed side by side and surrounded by theming that only Disney can achieve. The track layout is identical to the standard model ride, though the Disney version has been fitted with extra sensors to allow four additional cars to be operated. Each of these cars is noticeably wider than those seen elsewhere, and could easily fit three passengers per side. The restraint system has been designed for two, however; one can only assume that the cars were designed with american patrons in mind! Only the right hand side was operating when we approached, so we quickly got in one circuit. The Kali River Rapids ride was a particularly wet example of the genre. A geyser is strategically located at the top of the lift hill which was angled to soak just one lucky passenger (me) as the boat passed it. This, however, was not the major surprise. Half way through the course, totally invisible from the rest of the park, was an unexpected waterfall. The designers must have had a lot of fun creating this element. The boat approaches it almost painfully slowly, providing a view that is without question a real treat for those of a nervous disposition, or at least those watching them. Once the boat hits the waterfall it picks up speed rapidly, and those passengers on the leading edge end up positively drenched. George and I were on the opposite side and got to watch the spectacle in its entirety; my only regret is that I didn't catch the victims faces on camera! We went for a walk around the park to see if there were any other attractions of particular interest, but in the end decided to move on to MGM Studios. The route out took us past Primeval Whirl. The left hand side track was now operational, so we took a single circuit. It would have been interesting to see both sides operating together, but it was not to be; several engineers were doing some work on the track we had ridden just an hour before. Less than ninety minutes of our day had been spent in Animal Kingdom. One of my favourite rides when visiting Disney's California Adventure was the Tower of Terror. 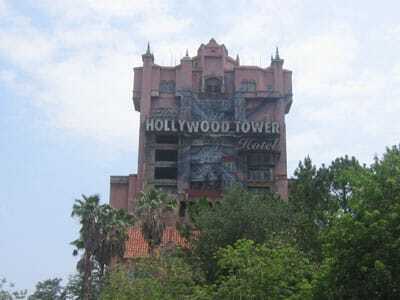 This is a heavily themed drop ride built into a dilapidated hotel,but rather than just providing one drop the elevator car bounced up and down the shaft a number of times. From outside the ride, the installation here appeared to be much the same as that in California. The theming on the way in, and indeed the introductory video was the same on both attractions. The ride unit itself, however, was somewhat different. The experience begins with the elevator cars being raised through the building and a number of dark ride scenes. Rather than this being the drop shaft, however, the car moves forward into The Twilight Zone, some more dark ride scenery which sets the stage for the story you are apparently involved in. This is far more effective than the theming in California and makes the whole experience seem far more real and less like a theme park attraction. Sadly, the illusion is hurt by the shuddering of the car and the clunking noise as it is aligned over the drop shaft. The reasons for this are mechanically understandable, but unfortunate; it would have been so much more fun if riders could not predict when the drop sequence would begin. My major criticism of the installation in California was that the overall ride length was simply too short. This is not a problem in the model here; the whole dark ride build up is quite a bit longer, and it seemed to me like the drop sequence had been lengthened too. The coaster enthusiast in me would have liked another few seconds of the latter, but judging by the smiles on the faces of the other riders everyone else considered the length to be perfect. Rock & Roller Coaster (#437) turned out to be exactly the same ride as that at Disney Studios Paris. The detail of the theming was slightly different but the basic outline was the same, including the unfortunate tie-in with Aerosmith. Nobody will ever try anything like it, but nevertheless I wish to propose the idea of "Beethoven's 5th Coaster", or perhaps "Carmina Burana: The Ride". If neither of these grabs you, the reader, then there are many other suitably dramatic classical compositions that could easily be adapted for coaster soundtracks, with the added bonus that all of them are out of copyright. Racing at fifty miles per hour through a tangle of treble clefs? You read it here first! The Studio Backlot Tour, however, opened with an entirely new scene not found in the Paris installation. Several audience members were invited to participate in the filming of a naval battle scene, complete with torpedo explosions and the obligatory extremely bad weather. On a peripheral note, has any movie studio ever produced footage of a naval battle at sea when there hasn't been torrential rain? This was followed by a similar tram tour to that at Paris, passing by a boneyard of obscure movie props and a few working sets. The major one of these was identical to the European model, with an oil tanker sliding off the side of a mountain and bursting into flame. The gas bill for running this set must be horrific, though it is probably negligible in the context of the resort running costs as a whole. Though George considered it to be missable, I particularly enjoyed the Who wants to be a millionaire? Play it! attraction. This is the same as the one from Disney's California Adventure which was recently removed. Hopefully the one here will remain, as it is extremely entertaining. The basic premise is the same as the TV show, with some small modifications. Chief among these is that the players are not competing for cash, presumably to keep the local gaming commission happy. The phone-a-friend option has also been altered to phone-a-complete-stranger, where a cast member pulls over a random guest in the park to get their opinion on a question. This apparently has been known to work occasionally! During the show we watched, the contestant in the hot seat was asked about his funniest experience at Disneyworld so far. After thinking for a few moments he declared it to be "getting my son on Rock & Roller Coaster". The camera focused in on the eight year old in question, who was shaking his fist and making extremely angry faces much to the amusement of everyone else around. The presenter asked the audience who had been on that ride, and about half the hands in the show went up. Then, he enquired who wouldn't be going near that ride, and the child's hand was the highest in his row! There were other interesting attractions we would have liked to check out, but we had seen them before in other parks. Time was getting on, and for this reason we left for Epcot just before 2:00pm. 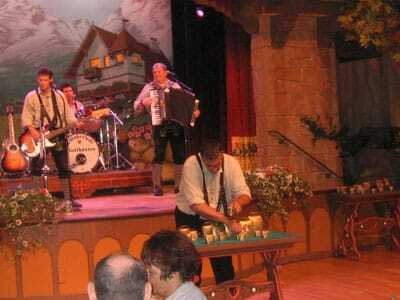 Our first task in Epcot was to find some lunch, and the ideal location turned out to be the German Biergarden. A delicious all-you-can-eat buffet with authentic cuisine (and more to the point, proper beer) was on offer. The staff were all the genuine article, with several customers conversing with them in German, and the food was superb. I could not resist going back for a second plate even though one would have been ample. It is very easy to see from restaurants like this one why so many people in the United States are overweight. The food was accompanied by three folk musicians performing on an indoor stage. All three were skilled on multiple instruments; voice, drums, guitar, and assorted members of the brass family. It was more than a little disconcerting to see them changing instrument in between phrases of the same song, but they were clearly well practiced at their art and could switch in less than a second with no apparent effort. The music would not have been out of place in the Eurovision Song Contest, but made entertaining listening nonetheless. In addition to the conventional instruments, each also took their turn at an obscure and unusual folk instrument. One was playing on a twenty foot long pipe which produced a pleasant tone somewhat reminiscent of a french horn. Another performed on a collection of about thirty bells. This was almost frighteningly good, and I shudder to even contemplate how much practice was involved in getting to performance standard. A third demonstrated a wooden instrument that looked something like a Xylophone but whose name escapes me now. Waddling somewhat after eating too much, we began a slow meander through the World Showcase. It quickly became clear that this would be the one major thing we could not appreciate in our rapid journey through Disney. The area consists of area themed after a large variety of countries, with different attractions, shows, and restaurants in each. It would not have been hard to spend half an hour or more in each section, but with the time constraints we were dealing with we had to settle for five minutes at most. Any longer and we would have had to skip over the Magic Kingdom, and to do that would be criminal. We did, however, take the time to do Soarin'. This is a simulated glider ride backed up by scent effects allowing riders to smell the oranges as they fly over growing fields. The version here had opened just six days before our visit, and this was very obvious from the queue, which ran to nearly an hour. It was running the same film as the original version, Soaring over California, though apparently a new movie is under development to replace it. There is no major reason for this to be honest, as the original movie works very well, featuring as it does scenes ranging from the Golden Gate Bridge to Yosemite National Park. While there was time for the Mission: Space attraction we both decided to give it a miss. The excesses of lunch time were coming back to haunt us, and the idea of a simulator with strong continuous forces was not appealing. The ride did sound very interesting, though, and will be high on my priority list for my next visit to Epcot. Instead, we joined the queue for Test Track. This is a very interesting attraction that lets guests experience the procedures involved in road testing a new vehicle, such as anti-lock braking systems, difficult road conditions, extreme temperatures, and of course handling. Using a traditional simulator platform for an attraction like this would never have been convincing. Instead, the designers elected to use model cars on a tracking system similar to that seen on dark rides. This allows demonstrations that are very realistic, including a banked turn test at over sixty miles per hour and a crash test. George works for a vehicle manufacturer in the United Kingdom, and as such has experience of real life test conditions. In his view, the attraction was very convincing and well done. Certain articles on the Internet imply that various effects have been broken for a long time, but this wasn't obvious to us as first time visitors. The skies had been getting darker all day long, and the heavens opened completely as we made our exit from Epcot, shortly before 6:00pm. As we boarded the monorail over to the Magic Kingdom I was momentarily convinced that I was back in Dublin. Then I remembered; there was useful public transport here. It couldn't possibly be home. One of the most impressive things about Disneyworld to me, as a regular park visitor, is the sheer efficiency of operation evident throughout the resort. One example was the purchase delivery service. All of the shops throughout the parks, including concession stands, had the facility for purchases to be delivered to your on-site hotel room free of charge. The delivery would not occur until the next evening, but the sheer fact that this was on offer at all shows how much money Disney guests spend in the resort. With this in mind, it is only right to comment on how long it should take to purchase a rain poncho from a store with five people in front of you in line. Two or three minutes seems reasonable to me, but for some reason, and in massive contrast to the rest of the park, the purchase took twenty minutes. Much of this was due to a rather angry American female who was whinging loudly but incoherently about something that was just unacceptable. I have absolutely no idea what this was, even having listened to a large portion of the rant, and it seems plausible that the staff had no idea either. Nevertheless, there were several staff members there, and it would have been nice if one of them had continued handling purchases. We had a quick look at the Adventureland Railway but it was closed due to thunderstorms in the area. The operator told us that the ride operated normally even in heavy rain, but the danger of a lightning strike was enough to shut down the system. We had an interesting conversation about the average weather patterns in Florida at this time of year, the conclusion of which was that it was simply unpredictable. With large plastic bags keeping the worst of the rain off we made our way over to Space Mountain (#438). This was the first Space Mountain ride, and was designed by Walt Disney himself. As such, it has absolutely nothing in common with the modern version in Paris other than the name. The trains on this model are reminiscent of those featured on early Schwarzkopf rides, and seat three passengers per car, with two cars per train. There is no soundtrack other than a rather strange opening sequence of light and sound that presumably simulates a jump to warp speed. Unfortunately, as the reader can imagine, this effect loses something when it is followed by a slow and noisy chain lift. Notwithstanding the above, however, the coaster has aged well and is in fine condition given that it is thirty years old this year. Most of the ride is in complete darkness, as there are almost no effects until the brake run at the end of the ride. There are two tracks, each of which we tried out, and while they are apparently different they felt the same to me. Does anyone have a photograph of the internal layout of the ride? Barnstormer (#439) was the only one of the three coasters in the park that would not be available after regular closing time. Rather than run the risk of missing it out altogether we decided to head over there even though it was still raining, though less heavily than it had been earlier. The ride was running, but the weather had kept most people away, and as such there was no queue whatsoever. The ride was a custom built Vekoma coaster found only in the Magic Kingdom, but in terms of ride experience it was no different to the production models. One of the most famous attractions in the Disney parks is known predominantly for its positively awful theme tune. Once it has found its way into your head it will stay there for hours, repeating its nauseating chant. The It's a Small World dark ride consists of a boat trip through an intriguing exploration of the various cultures of the world, demonstrated by two foot high animatronic models. The scenery is really quite interesting, and would be so much more enjoyable if they would only get a new soundtrack! Another staple attraction in the Disney parks, and one of my particular favourites, is the Haunted Mansion. For those that are not aware, this is an extremely elaborate and well themed ghost train, complete with convincing ghostly projections and a catchy theme tune that, unlike the previous ride, is not irritating in the least. The ride itself is far larger than the exterior building would suggest, and in fact is located in a separate building hidden some distance away. Riders enter the mansion and, in theory at least, gasp in horror as the floor sinks away and the ceiling becomes taller. Unfortunately for the cast member on duty, nobody seemed all that phased today, resulting in an exasperated whine: "Oh, come on, it's scary! On you go, then...get out of here...". Everybody found this response extremely amusing, making me wonder if it might be scripted into the attraction for situations like this one. It could, of course, be there already! The final coaster of the day was my third Big Thunder Mountain (#440). There was almost nobody waiting for the ride at all, and three train operation meant that I walked straight into a seat. By this stage it was almost regular park closing time, and as such we headed back to the center of the park to watch the nightly firework spectacular. The fireworks are accompanied by a medley of various Disney themes with the usual suspects in prominence, such as When you wish upon a star et al. As most of the guests moved towards the exit, we headed back over to the rides to take advantage of the so-called "extra magic" time. It took several minutes to get enough people to fill a boat for Pirates of Caribbean, and we ended up stuck in the unloading queue for nearly five minutes due to other empty boats in front of us blocking the station. The same was not true for the flume ride, Splash Mountain, which had a five minute wait. Neither of us had ever tried a flume in a Disney park, and we realised with this one what we had been missing. The track was surprisingly long, with a number of good drops. The night finished up with a whirlwind through a couple of the staple attractions; Big Thunder Mountain, Peter Pan, Philharmagic, Snow White, Winnie the Pooh, and finally Buzz Lightyear.